At this point in the winter it is no secret that El Nino is strong, and has already toppled records, depending on what index you look at. With that said, it certainly continues to play a critical role on the weather across the Lower 48. Over the weekend, record high temperatures were recorded in 23 states, mainly east of the Mississippi River. This unprecedented warm stretch of weather is thanks to a large ridge that has persisted over the eastern half of the country. This blocking, pushes the jet stream north and allows warmer weather from lower latitudes to move north as well. While some people may be ready for winter, mother nature has different ideas. Besides a brief cool down later this week, the rest of December looks to stay on the warm side, east of the Mississippi River. However, this battling of air masses could set up a major storm system around Christmas. Current indications are that it will be cold enough for snow north and west of the track. We are still 10 days out from the event, so the track is in question, but the best guess would take it up from the southern Plains to the Upper Mississippi River Valley. 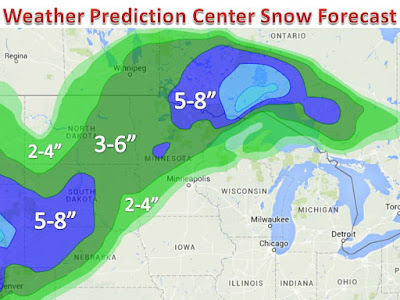 It looks to the be the best shot for a white Christmas across the most populated areas in the Midwest, besides Tuesday-Wednesday for areas further west...see snow map below. 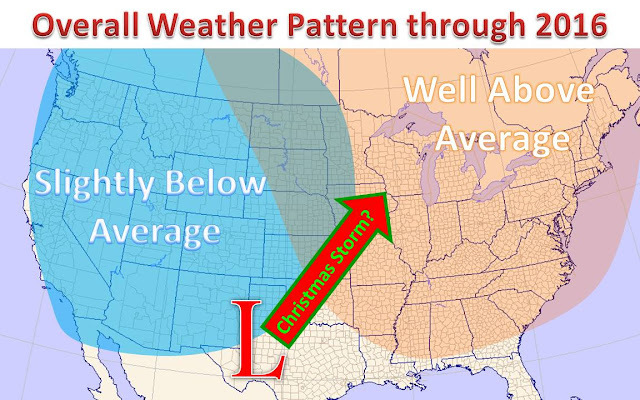 Be sure to check back for updates on this possible Christmas Winter Storm in the coming days!